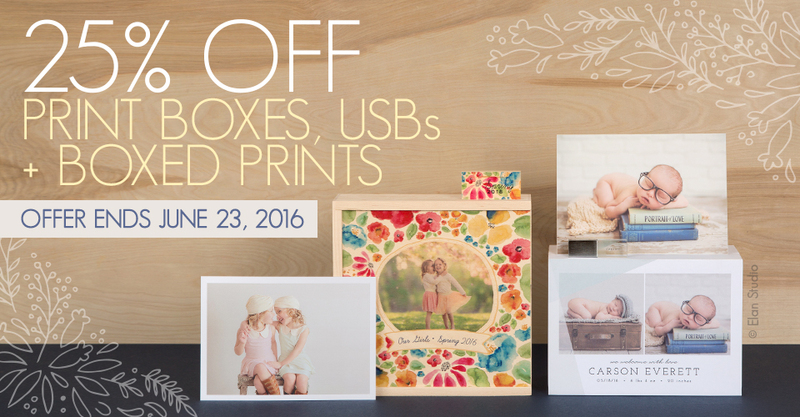 Now through June 23rd, save 25% on everything in the Print Boxes, USBs and Boxed Prints category. It’s the little details that influence the overall experience for your customers. Whether it’s giving them the tactile sensation of holding their Prints in a timeless Wood Print Box or discovering a visually appealing way to pair digital files with physical Prints in a Slide Print Box + USB, the products you offer set your business apart from your peers. This offer is available in ROES and DesignerPlus (no codes required). Products eligible for discount include Custom USB Drives & Boxes, Slide Print Box, Wood Print Box, Slide Print Box + USB, Wood Print Box + USB and Custom Wood Photo Box. This offer expires on June 23rd at 11:59 p.m. I am looking to order 15 8GB Acrylic USBs with the black box. Please let me know what the final amount would be after the 25% discount. Hi Duaine, the total should be $420. Hello, I see there is a 10 print min when ordering, but how many prints and mounted prints can these new print boxes hold? Thanks! Hi Ashley, the discount will be applied when the order has been processed by the lab. Thanks! Yes, the discount will be applied once your order has been processed by the lab. Our apologies for the confusion, thanks for reaching out to us! I don’t see where it says on the Pricing tab on the product “Slide Print Boxes” how many prints or mounted prints the box holds, AS Aimee mentioned above. Please advise.